In the spirit of our remix feature this 7 inch release features two remixes that really are a step up on the originals. Released last Monday, this remix single features Deerhoof and Kid 606 offering new interpretations of Xiu Xiu offerings. From Xiu Xiu's 'Always' album, Greg Saunier of the mighty Deerhoof has remixed 'I Luv Abortion' and given it a mysterious spin that darkens the mood and heightens the tension. It's a no-wave protest song of the highest order under his precise guidance and this makes for a truly atmospheric lyrical experience where shards of the words cut through to make their point oh so effectively. The challenge is answered by the Kid 606 (Miffy) remix of 'Joey's Song' which is a dark dance anthem with a banging beat. it's really Xiu Xiu on acid and it takes a a sinuous, throbbing path to an anthemic and uplifting conclusion. Quite brilliant. So two super remixes that prove how powerful second thoughts can be. Even if you don't own 'Always' you need this spectacular 7 inch marvel. 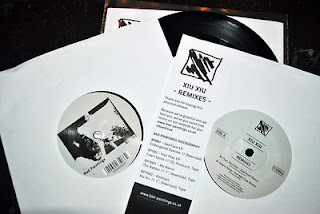 The Xiu Xiu remix single came out on Bad Paintings on 23 July.